I was born in Caracas, Venezuela, the granddaughter of Spanish exiles and daughter of immigrants. I was raised in Spain since I was six. I moved to California to do my PhD.and I have lived in the United States since then. From 2013-15 I lived in Barcelona, where I was the resident director of the University of Illinois-University of California Education Abroad Program. Modern and Contemporary Spanish Literature and Cultural Studies. Cultural Construction of Identities. Ideology and Culture. Public emotions and Collective Affects. The focus of my current research and teaching is the cultural construction of Spanish national identity in the democratic period. I have two other lines of research underway: one analyzes the state of Hispanism and explores alternative ways to conceptualize the discipline --including, but not limited to, transnational and/or Iberian Studies approaches. I have a contract with Polity Press (UK) for a Cultural History of Modern and Contemporary Spanish Literature, co-authored with Jo Labanyi (NYU). The book will also have the collaboration of experts in Catalan, Basque and Galician literatures. My other area of research now is the study of emotions and affects in the public sphere, and the relationship between politics and collective emotions. Part of that research is included in the co-edited volume (with Pura Fernandez and Jo Labanyi) Engaging the Emotions in Spanish Culture and History (Vanderbilt University Press, 2016). An updated version appeared in Spanish in 2018 (Las emociones en la cultura y la cultura de las emociones, Catedra). Along those lines, I am now working on how emotional and political attachments intersect and function in narratives of citizenship at moments of crisis: the movement of the Outraged in Spain (2011- 2015), the independence referenda in Scotland and Catalonia (2014, 2017);the peace agreement referendum in Colombia (2016); and the internationalfeminist demonstrations against inequality and abuse (2017- present). Last, but certainly not least, I am interested in the connections between academic research and public life, as well as in the debates and practices that define democratic citizenship. 2009-2010. Humanities Council Teaching Excellence Award. (University of Illinois). 2010-11 Unit for Criticism and Interpretive Theory Nicholson Fellow. 2015 Finalist, Premio Nacional de Ensayo (National Literature Award, Essay). Spain's Ministry of Education, Culture and Sport. 2016-17 Illinois Program for Research in the Humanities Fellow. 2009 Centre for Scientific Research (CSIC- Spain). Delgado et al., L. Elena La cultura de las emociones, las emociones de la cultura. Madrid Catedra 2018. PUblisher catalog. 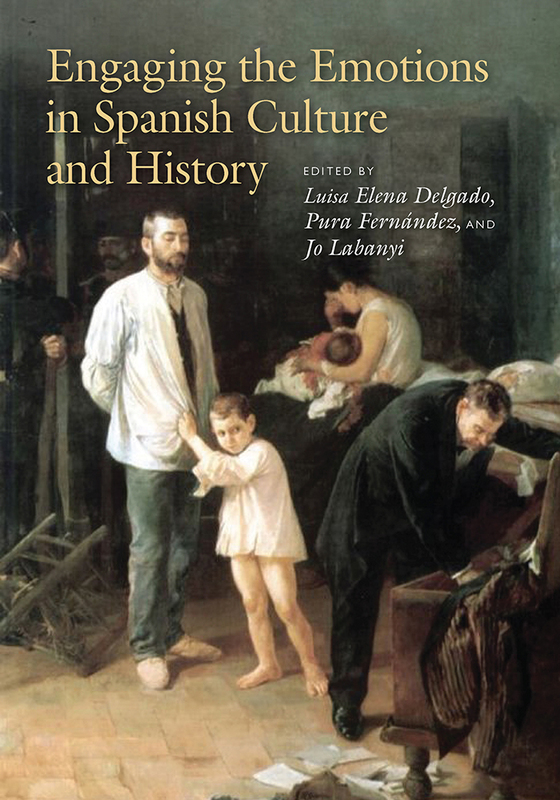 Engaging the Emotions in Spanish Culture and History (from the Eighteenth Century to the Present) edited by Luisa-Elena Delgado, edited by Pura Fernández, edited by Jo Labanyi. Edited by Luisa-Elena Delgado, Edited by Pura Fernández, Edited by Jo Labanyi, Nashville Vanderbilt UP 2016. Catalog. photo. Delgado, Luisa Elena La nación singular. Fantasías de la normalidad democrática española (1996-2011). Madrid Siglo XXI Editores 2014. Publisher information. La imagen elusiva: lenguaje y representación en la narrativa de Galdós. [The Elusive Image: Language and Representation in the Narrative of B.P. Galdós.] Amsterdam/Atlanta Rodopi 2000.
f we build it, will they come? Iberian Studies as Field of Dreams Iberian Modalities f we build it, will they come? Iberian Studies as Field of Dreams 2013. “The Astigmatic Vision and the Perception of Minority Literatures” Writers in Between Languages: Minority Languages in the Global Scene “The Astigmatic Vision and the Perception of Minority Literatures” University of Nevada UP, Center for Basque Studies 2010. “Gertrudis Gómez de Avellaneda: escritura, feminidad y reconocimiento.” La mujer de letras o la letraherida. Textos y representaciones del discurso médico-social y cultural sobre la mujer escritora en el siglo XIX edited by Pura Fernández, edited by Marie Ortega. “Gertrudis Gómez de Avellaneda: escritura, feminidad y reconocimiento.” Edited by Pura Fernández, Edited by Marie Ortega, Madrid-Toulouse-LeMirail Consejo Superior de Investigaciones Científicas 2008. “El artista frente al abismo. Modernidad y decadencia de Antonio de Hoyos.” En el país del arte: la novela del artista edited by Facundo Tomás. “El artista frente al abismo. Modernidad y decadencia de Antonio de Hoyos.” Edited by Facundo Tomás, Valencia Biblioteca Valenciana 2003, p. 101-23. Delgado, Luisa Elena "The Sound and the Red Fury: The Sticking Poings of Spanish Nationalism" Journal of Spanish Cultural Studies 11 3-4 2010, p. 263-286. Deshaciendo los nudos: fetichismo y feminidad en la narrativa de Jasone Osoro Bulletin of Spanish Studies 2009. La nación (in) vertebrada y las crisis de la normalidad democrática Revista científica de información y comunicación 2009. Mendelson, with Jordana, and Luisa Elena Delgado “Recalcitrant Modernities: Spain, Cultural Difference and the Location of Modernism.” Special issue of Journal of Iberian and Latin American Studies 13 2.3 2007. Delgado, Luisa-Elena 	“Sobre el nacionalismo banal (español)” La maleta de Portbou 2019. 	“El corazón patriótico”, Tribuna. CTXT 2018. Illustration. Prof. L. Elena Delgado’s work on Spanish nationalism, the Catalan secessionist movement, the links between Spain and the US and the impact of the feminist movement on current politics has been recently showcased in the magazine CTXT. Prof. L. Elena Delgado has been selected as a University Scholar for 2018-2019. The University Scholars Program honors and rewards the most outstanding faculty at the University of Illinois.